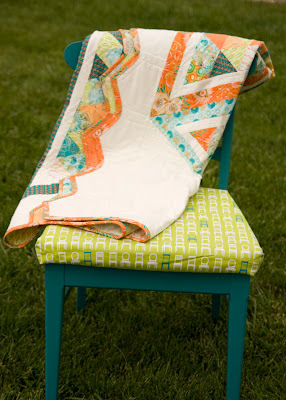 from the blue chair: Hexagon Quilt--Finished! Head over here for the Go! Baby Giveaway if you haven't signed up yet. I finished this guy up this afternoon. I just had to sew the binding down. I was really excited to get that job done. For some reason I didn't think about how painful the binding would be when I decided on the design. There were a lot of corners to go around. The fabric is Color Splash from Art Gallery. The hexagons are 6" finished, and the quilt is approximately 58" x 70". I am so excited with how the back came together. I used the leftover little triangle scraps from cutting my hexagons. I've decided I'm done with hexagons for a while... that is after I teach my sister how to sew them this weekend. now THIS is BEAUTIFUL! :) I love both sides... and I'd have a hard time thinking of the back as the "back"... I think I'd call it another front. :) Great job. It's just stunning! This is a fantastic quilt! I love seeing your work - always so inspiring. I love both sides of this quilt, but the "back" just knocks me out! WOW! Kati, you are ridiculously awesome! 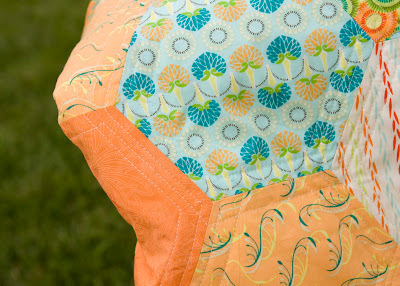 I love how your quilt backs are just as amazing as the fronts. How on earth do you decide which way is up? love, love, love this! The back is great and I love the color combo. Great job! Wow! You've done such a great job on this quilt. 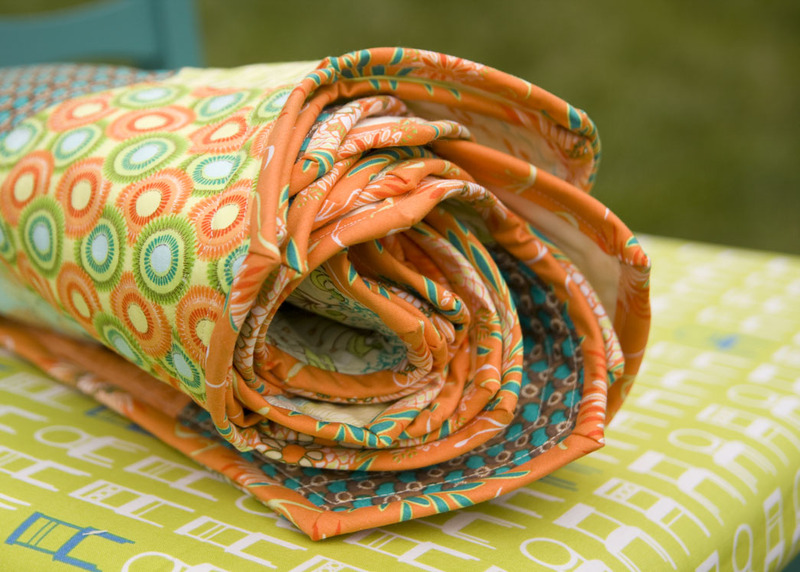 The fabrics play together so well. And the back ... such a beautiful grouping of triangles to form one more large hexagon. I'm guessing that was fun to design and took lots of patience to sew. Thanks for sharing! 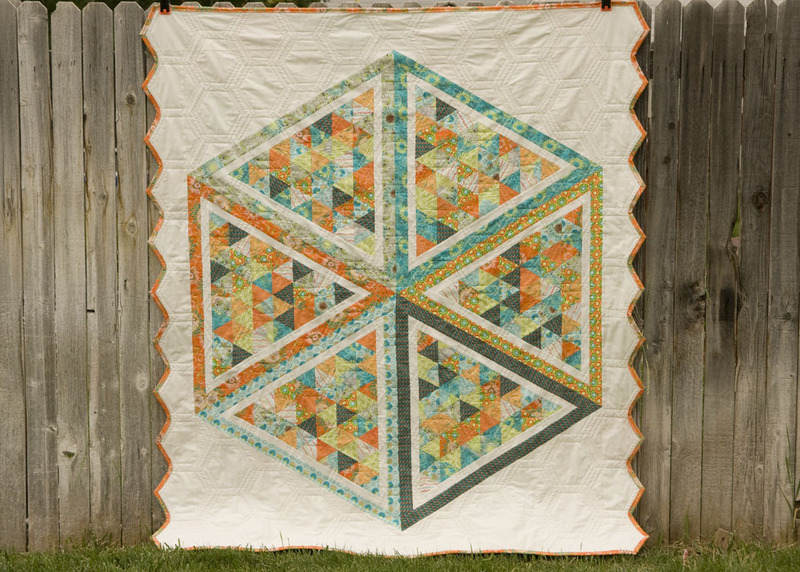 Congratulations on such a gorgeous finished quilt. You are my super hero! I've been trying to sit down and sew for the last 2weeks and it's just not happening. Here you are chugging out a awesome quilt. I'm jealous! I love it!! Great job and that back is just amazing! 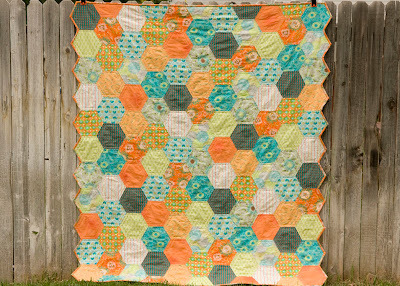 I love hexagons and like the edge but I bet it was a pain, at least they are big hexies and not 1" - lol. Awesome, Kati! I love both sides. It's fabulous and the backing is amazing,I love how you used the off cuts. I love your work, you have such a great eye for design and colour. insane...I can't believe how much work you pout into the backs! Both sides are gorgeous. You did a fantastic job. You must sew all day and all night! (which i know you don't b.c. you have kids!) i don't know how you do it!! I can't get over this quilt! I love hexagon quilts, so that was no surprise, but the back is amazing! You are so creative! I would have never thought to use the leftovers that way. Brilliant! Gorgeous! The back is really stunning and I'm in awe of that binding, great work!! The back! Wow! Is there a trick for binding the inside corners? Oh my goodness, I don't know what I like more, the front or the back!! Both sides are equally awesome. Great job!! Beautiful quilt! I LOVE the back. Simply amazing. Wonderful quilt, both sides. You did a great job. Wow!! 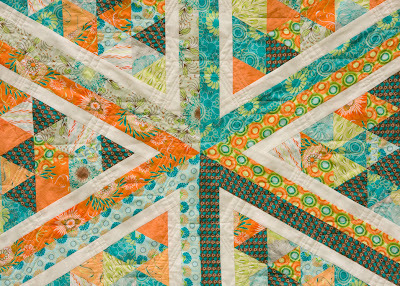 What a gorgeous quilt!!! I think I like the back better than the front! It's beautiful, great colors. The front and back are gorgeous! What a great idea. Holy crap, Kati! This quilt is amazing and the back is absolutely stunning! Will you just come and sew at my house and then leave all your projects here?! Whoa! How cool is that back! I totally would have tossed all those triangles - we don't get along well. 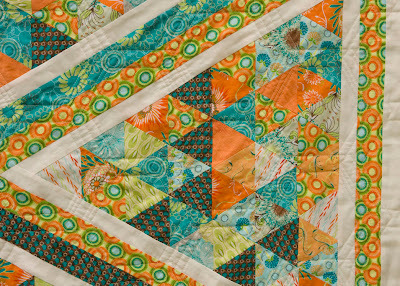 Wish I could pop over and sit with you to watch some triangle sewing. Awesome job going with the crazy long zigzag binding. It looks fabulous. I think the back is my favorite! You always make such fun quilt backs! Kati, I've run out of superlatives. This is completely stunning, "back" AND front! I absolutely love it! 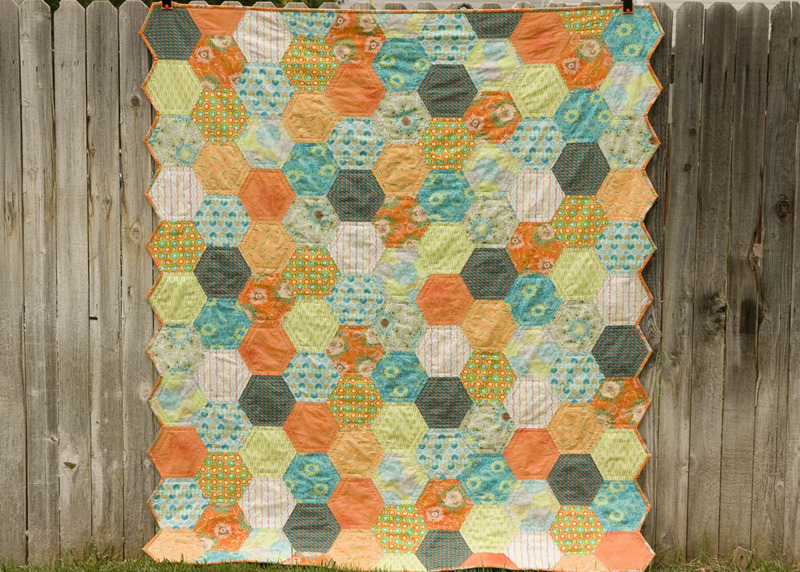 I'm not fond of hexagons (to say the least) but I love this quilt! Wow amazing! Just had to comment, so pretty! The back is fantastic - Am I allowed to like it even more than the front? Hexagons are a fiddle, but well worth the result. That is stunning! The "back" is mesmerizing. Both front and back are beautiful!!!! I love the rows of hexagons on the front, but I really, really love the back! This is gorgeous! I can't imagine how fussy it must have been to sew together. 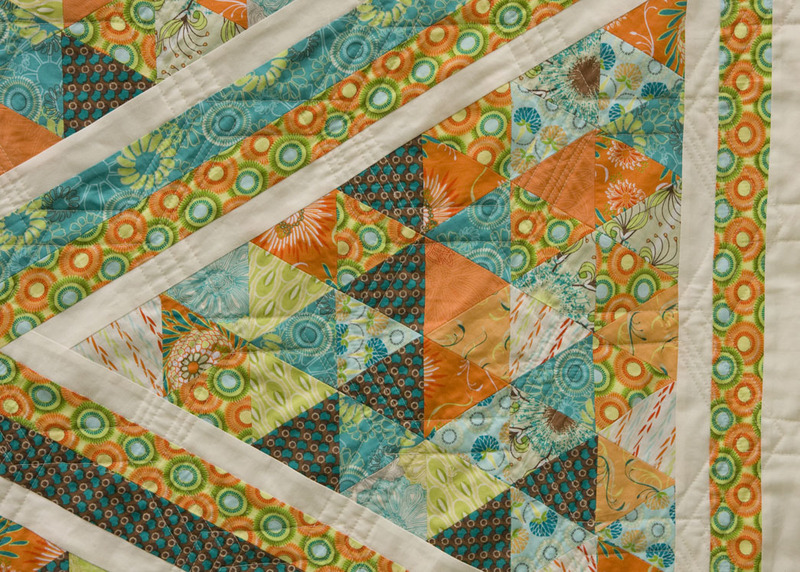 So many y seams and triangles. And the binding! You truly are an amazing quilter!! Great. As always, I love the colours you've chosen for the quilt. And what a clever way of using the leftover triangles. Both sides are great- not sure which I like best! Amazing yet again! And I think that your quilt backs are the best ever. You amaze me. You have got to be kidding me - how on earth did I miss this Kati??? I love the front but I love the back even more and that binding must have been a right royal PITA. Beautiful! I would call this a reversible quilt since both the front and back are wonderful! The back of the quilt is just wonderful and very creative! wow - awesome quilt- both the front and back. i'm blown away by the back, made out of those scraps. Way to use up those scraps! thanks for the hexagon tutorials, i think i'm going to try this.